A mix of clouds and sun. A stray shower or thunderstorm is possible. High 83F. Winds SSW at 5 to 10 mph.. Rain showers early will evolve into a more steady rain overnight. Thunder possible. Low around 60F. Winds S at 10 to 15 mph. Chance of rain 80%. To submit an item for the Community Calendar, send an email to dvidovich@HDMediaLLC.com. Meet the Author - Charlie J. Eskew, 7-8:30 p.m. Thursday, April 25, at the Savas Kostas Performing Arts Center, located on the Logan campus of Southern West Virginia Community and Technical College. Nighbert Memorial Church "Gabriel Project," 11 a.m.-1 p.m. Thursday, April 25. "Gabriel Project" is held on the last Thursday of each month, except for holidays, etc. Youth Revival, 7 p.m. April 25-27, at Hannah United Baptist Church, Harts. Preaching by Drew Bledsoe and special singing nightly. Logan's Got Talent, 7 p.m. Friday, April 26, at Southern West Virginia Community and Technical College, Logan. Hosted by Logan County Family Resource Network, NECCO, KVC, ResCare and Children's Home Society. Celebrity judges are singer Anna Butcher, "America's Got Talent" winner Landau Eugene Murphy Jr. and WCHS TV's Kennie Bass. Grand prize winner receives a recording session with Landau's producer at Chandler Audio Studios, the opportunity to perform at the Coalfield Jamboree and $500 cash. Admission, $1. LEASA CPR/first aid training, 6-8:30 p.m. Friday, April 26, at 511 Dingess St., Logan. Shine Campaign, 6-9 p.m. Saturday, April 27, at the Logan Shrine Club in recognition of National Child Abuse Prevention and Awareness Month. Hosted by Logan/Mingo Child Advocacy Centers. Finger foods, water and soda. Admission, $10 per person or $15 per couple. Make Our Town Shine Chapmanville community cleanup day, beginning at 9 a.m. Saturday, April 27, at the Tracy Vickers Community Center. Volunteers will be split up into groups and will be provided materials such as gloves, garbage bags and needle disposal containers. Country night, 9 p.m. Saturday, April 27, at Keith's Bar & Grille, 20 Mingo Hwy, Man. The Chapmanville United Baptist Church will have Sunday School beginning at 10 a.m. and morning worship at 11:25 a.m. Sunday, April 28. Brother Alan Frye will be preaching and Tony Bell will sing. Southern West Virginia Community and Technical College “Community Listening Sessions,” noon Tuesday, April 30, at the Logan Campus. For more information, contact Mandy Lester at 304-896-7429 or mandy.lester@southernwv.edu. Free diabetes class hosted by Quality Insights Quality Innovation Network (EDC West Virginia), 1-3 p.m. Wednesday, May 1, at the Tracy Vickers Community Center in Chapmanville. WV Birth to Three RAU IV Logan County playgroup, 12:30 p.m.-1:45 p.m. Wednesday, May 1, at the Logan Area Public Library, 16 Wildcat Way, Logan. 2nd Annual Appalachian ATVentures Festival, Thursday-Sunday, March 2-5, Gilbert. Visit twinhollowcampground.com. National Day of Prayer Observance, 6 p.m. Thursday, May 22, Logan County Courthouse. Fundraiser Hotdog & BBQ Sale, 10 a.m.-4 p.m. Thursday, May 2, and 10 a.m.-5 p.m. Friday, May 3, at The First Church Of Christ, Chapmanville. Proceeds help Team Ersel. Call the church at 304-855-4080. Tamarack Creative Network - NEA Our Town Grant, 11 a.m.-2 p.m. Friday, May 3, at Logan Country Club, Chapmanville. RESIN Live, 7 p.m. Saturday, May 4, at Hot Cup, 201 Stratton St, Logan. Free Yard Sale Day, Saturday, May 4, in Chapmanville. Some spaces available outside the Tracy Vickers Center for those who live outside city limits. Contact the Town Hall. Liam Farley with special guest Coal-Fired Band, 7 p.m. Saturday, May 4, at the Rose G. Smith Theater, Williamson. Tickets are $10 at www.itickets.com or Hannah’s Pawn Shop or the Coal House in downtown Williamson. Door tickets are $15, cash only. Logan Shrine Club 6th Annual ATV/SxS/OHV/Jeep Poker Run, 9 a.m.-4 p.m. Saturday, May 4. 14th Annual Steve 'Duco" Ratz Memorial Ride hosted by Logan Motorcycle Sales, 10:30 a.m.-5 p.m. Sunday, May 5. Registration starts at 10:30 a.m. and the ride starts at 1 p.m. at Logan Motorcycle Sales. $20 per rider, $10 per passenger. All proceeds go to the June Harless Children's Shelter. Free diabetes class hosted by Quality Insights Quality Innovation Network (EDC West Virginia), 1-3 p.m. Wednesday, May 8, at the Tracy Vickers Community Center in Chapmanville. 86th Annual Logan County Chamber of Commerce Membership Dinner, Thursday, May 9. Featuring a performance by Adam DeGraff. Children enrolled in Head Start/Universal Pre-K and their families are invited to Family Fun Day, hosted by PRIDE Community Services, from 11 a.m.-2 p.m. Friday, May 10, at Chief Logan State Park, for an afternoon of inflatables, face painting, pizza, silent auction, ice cream, etc. Public school age children are not permitted to attend. Comedy Night with Josh McDonald and Brian Thompson, 6:30 p.m. Saturday, May 11, at Hot Cup, Logan. Tickets, $5. Ralph R Willis Fun Day, 10 a.m.-5 p.m. Saturday, May 11, at Ralph R. Willis Technical Center, Logan High School. Fundraiser for LPN class. Car show, motorcycle show, ATV show, vendors, food trucks and inflatables. Free diabetes class hosted by Quality Insights Quality Innovation Network (EDC West Virginia), 1-3 p.m. Wednesday, May 15, at the Tracy Vickers Community Center in Chapmanville. Paint & Play, 6:30 p.m. Friday, May 17, at the Jump House, Logan. Cost, $30. Kids can jump for $5 each. Routine Days, Waxjaw live at Hot Cup, 7-10 p.m. Saturday, May 18. Kids "On the Move" Walk hosted by Buffalo Creek Memorial Library and ResCare Community Living Logan/Boone Agency, 11 a.m.-2 p.m. Saturday, May 18. For more information, call the Library at 304-583-7887 or message them on Facebook. Free diabetes class hosted by Quality Insights Quality Innovation Network (EDC West Virginia), 1-3 p.m. Wednesday, May 22, at the Tracy Vickers Community Center in Chapmanville. Logan High School Graduation, 4 p.m. Friday, May 24. Mingo County Memorial Day Parade and Recognition, noon Monday, May 27, at the Mingo County Courthouse. To participate, visit www.facebook.com/King-Coal-Festival, email kingcoalfestival@yahoo.com or call 304-235-0909. Vendors may register for $20, with setup from 10 a.m. to 3 p.m. Musicians are invited to register to perform patriotic music. Free diabetes class hosted by Quality Insights Quality Innovation Network (EDC West Virginia), 1-3 p.m. Wednesday, May 29, at the Tracy Vickers Community Center in Chapmanville. WV Birth to Three RAU IV Logan County playgroup, 12:30 p.m.-1:45 p.m. Wednesday, June 5, at the Logan Area Public Library, 16 Wildcat Way, Logan. 20th Annual Hatfield McCoy Marathon, 7 a.m. Saturday, June 8, Williamson. Visit www.hatfieldmccoymarathon.net. Enemy of All, with Awakened, live at Hot Cup, 7-9 p.m. Saturday, June 15. Tickets $2. Nighbert Memorial Church hosts a free community dinner every Wednesday at 5:20 p.m. in the fellowship hall. Nighbert Memorial Church's children's music ministry takes place from 6 to 6:45 p.m. every Monday for ages 1 to 7. The youth meeting for the Chapmanville United Baptist Church is 7 p.m. Wednesday. Leaders are Sisters Heather Woody and Barbara Ellis. Chapmanville Town Council meets at 7 p.m. the second Monday of every month at Tracy Vickers Community Center, 68 Boise St, Chapmanville. Call 304- 855-4582. Logan City Council meets at 6 p.m. the second Tuesday of every month at Logan City Hall. Call 304-752-4044. Logan County Chamber of Commerce meets at 8 a.m. the second Tuesday of every month at Logan County Chamber of Commerce, 325 Stratton St. Call 304-752-1324. Logan County Commission meets at 3 p.m. the first and third Monday of every month at the Logan County Courthouse. Call 304-792-6217. Logan County Board of Education meets at 5 p.m. the second and fourth Thursdays of every month at Ralph R. Willis Career and Technical Center. Call 304-792-2060. Logan County Board of Health meets at 4:30 p.m. the second Tuesday of every month at the Logan County Health Department, 300 Stratton St., Logan. Call 304-792-8630. Logan County Public Service District meets at 6:30 p.m. the first and third Tuesdays of every month at the district's office at 41 Armory Road, Monaville. Call 304-946-2641. The Town of Man Council meets at 7 p.m. the second Monday of every month at the Man Town Hall. Call 304-583-9631. The Tracy Vickers Center Board meets at 6 p.m. the second Monday of every month at Tracy Vickers Community Center, 68 Boise St, Chapmanville. Call 304- 855-4582. The Logan County Development Authority meets at 1 p.m. the second Wednesday of every month in the conference room of the Logan County Commission building, 325 Stratton St, Logan. Call 304-752-4600. 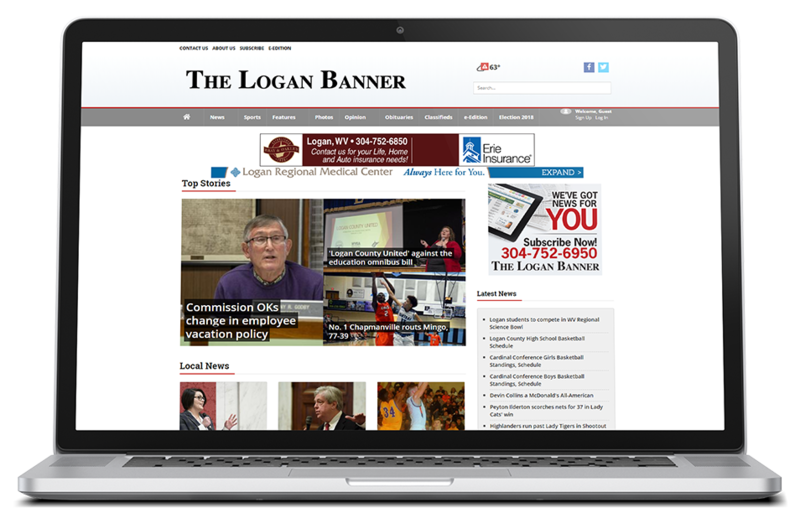 The Logan County Airport Authority meets at 2 p.m. the second Wednesday of every month in the conference room of the Logan County Commission building, 325 Stratton St, Logan. Call 304-752-0975. The Logan County Housing Authority meets at 3 p.m. the second Wednesday of every month in the conference room of the Logan County Commission building, 325 Stratton St, Logan.